That was two years before Ryan was first elected to Congress. Since then, Ryan and other conservatives have studied federal poverty programs, including the Temporary Assistance for Needy Families program that was created by the 1996 law. They’ve concluded that the programs are not driving the results they should, but they have made little headway in pushing for changes they think would help lift people out of poverty. Now the retiring Ryan is spending his final year in office making one last anti-poverty push. The House under his leadership is exploring another overhaul to TANF, as well as major changes to the Supplemental Nutrition Assistance Program, otherwise known as food stamps. Even so, the overhauls, which face steep odds to become law, are only small pieces of the poverty agenda Ryan has spent his career developing. Another small part of the agenda Ryan has gotten passed into law is included in the tax overhaul. The law designates opportunity zones based on some of the poorest census tracts and allows people to avoid capital gains taxes when selling an asset by investing in those areas. Ryan’s effort is more than just a conservative policy agenda. It’s personal. The speaker has spent time in impoverished communities, visiting charities and private sector organizations that are fighting poverty in ways he does not believe the government can. “Catholic social teaching tells us that our public moral culture — the foundation of our political culture — is shaped by these natural institutions and free associations of civil society. And it cautions us against allowing the state too great a reach into civil society,” Ryan said during his May 24 address to the National Catholic Prayer Breakfast. It is the success stories Ryan witnessed during his travels — he mentioned a recent trip to Catholic Charities Fort Worth — that he hopes to replicate. Ryan frequently says that his goal in overhauling welfare programs is to “break up the poverty monopoly” and create a competition for federal dollars that is based on results. Where Democrats see his proposals as gutting government programs for the poor, Ryan argues the resources would simply be directed where they’re most useful. “This is about saving souls, not dollars,” he said in the PBS interview, noting that money would be saved on the back end when more people are out of poverty and off government assistance. Ryan inherited his passion for fighting poverty from his longtime mentor and former New York Rep. Jack Kemp. The aspiring wonk met Kemp while working as a waiter at Tortilla Coast and later went to work for him at his think tank, Empower America. He accompanied Kemp on some of his visits. In the early 1990s Kemp introduced Ryan to Bob Woodson, who heads a center focused on helping low-income neighbors. 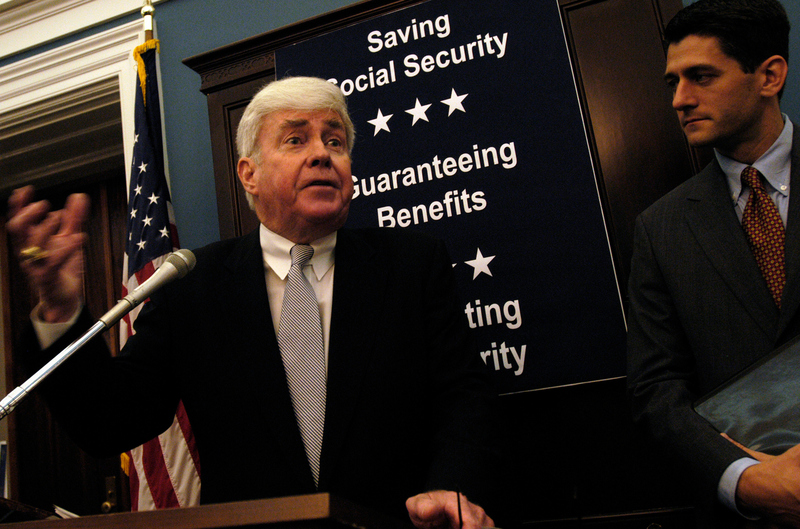 After Kemp’s death in 2009, Woodson became Ryan’s go-to adviser on poverty. Ryan reached out to Woodson to help develop a poverty platform for his 2012 vice presidential campaign with Republican presidential nominee Mitt Romney. When Ryan returned his focus to Congress after the 2012 loss, he reached out to Woodson for help in learning more about “homegrown” solutions to poverty, Ryan said in a recent videotaped conversation with Heritage Foundation President Kay Coles James. “Bob and I for a couple of years flew around America, and he took me into some of the toughest, hardest-hit, most poor communities in rural and urban America,” Ryan said. During those trips Ryan witnessed the work of poverty fighters on the ground that was leading to results, just as he had years earlier when following Kemp. Ryan connected with people who had lifted themselves out of poverty and related situations like gangs and crime, people who redeemed themselves and wanted to do the same for others. He said he saw firsthand the power of work, though that was something he witnessed too in his own home growing up. After his father died when he was 16, Ryan watched his mother go back to school so she could start a small business and provide for their family. “That to me was so inspiring,” he said. Ryan explained to Coles James that his welfare overhaul push is in part about a “mental change on our approach to poverty” and he took aim at the War on Poverty launched by the administration of President Lyndon B. Johnson. “The basic take on this War on Poverty is we were telling people in America, ‘You are stuck in your current station in life and government is here to help you cope with it.’ Which is antithetical to the American idea of opportunity, and upward mobility and flourishing,” he said. Certainly Ryan has supporters for his agenda in Congress, even among the conservative House Freedom Caucus that has made his management of the issues difficult as it blocks compromises in search of far-right results. Ohio Republican Rep. Warren Davidson is one of those Freedom Caucus members. But such simpatico beliefs don’t mean the Freedom Caucus is going to make things easy for Ryan in his remaining time, even on items they agree on. Take, for example, the recent defeat of the farm bill, when 30 Republicans, including Davidson, joined Democrats in opposing the legislation on May 18. The strict work reporting requirements for food stamp beneficiaries included in the bill were never going to be easy to get through the Senate, given Democratic opposition. But Ryan couldn’t even get that popular GOP policy through the House, with some moderate Republicans opposed to the changes and conservative Republicans objecting to the bill to leverage concessions in an unrelated immigration debate. The farm bill would have required able-bodied adults who don’t have children under age 6 to work or participate in job training for at least 20 hours a week to receive SNAP benefits. “This is going to help get more Americans out of poverty, and it’s going to help more Americans get into the workforce, while maintaining support for those in need,” Ryan said on April 12 as his allies introduced the legislation. That wasn’t enough to get it through the House the next month. Rep. Chris Collins, a relatively moderate Republican from upstate New York, says he doesn’t understand why some of his colleagues objected to work requirements for SNAP, citing a high level of public support for the concept. Ryan still has a shot to get the bill through the House. A revote is planned for June 22. The time and energy party leaders will have to expend to pass the farm bill — which will require appeasing conservatives on a separate immigration issue — could eat up resources for other welfare legislation, like a bill to restructure the TANF program. The measure, recently reported out of the Ways and Means Committee on a party-line vote, would rename TANF the Jobs and Opportunity With Benefits and Services program, or JOBS, and require that funds go only to people living under 200 percent of the federal poverty line. The bill requires states to use part of the federal funding to support job training and child care assistance with the goal of helping get people off welfare and into the workforce. States would have the flexibility to tailor their own programs, but the federal government would track their progress. TANF, like the farm bill, is scheduled to expire Sept. 30. Since reauthorizations of both are needed in a matter of months, Ryan has little time to convince House and Senate lawmakers and President Donald Trump to back his welfare overhaul push. It is a long-shot pitch in a midterm election year, but Republicans like Pennsylvania Rep. Mike Kelly, who, like Ryan, is a conservative Catholic, believe the speaker can get at least some of it done before he leaves Congress. “He’s a great, great guy [who’s] devoted a lot of his time and life to this,” Kelly said. If Ryan’s poverty and welfare policy push fails to gain traction before he leaves Congress, he says he is not planning to give up the fight. And inside Congress there will still be several members ready to pick up the poverty fighting mantle. During the PBS interview, Ryan named GOP Reps. Elise Stefanik of New York, Brad Wenstrup of Ohio, Mark Walker of North Carolina, Sean P. Duffy of Wisconsin, Keith Rothfus of Pennsylvania and Barbara Comstock of Virginia, along with Sens. Tim Scott of South Carolina and Marco Rubio of Florida, as some of the lawmakers helping push an anti-poverty agenda. “There’s a lot of young and up-and-coming leaders who are in Congress, who are out of Congress, who are governors, who are making a big difference in this area,” he said.